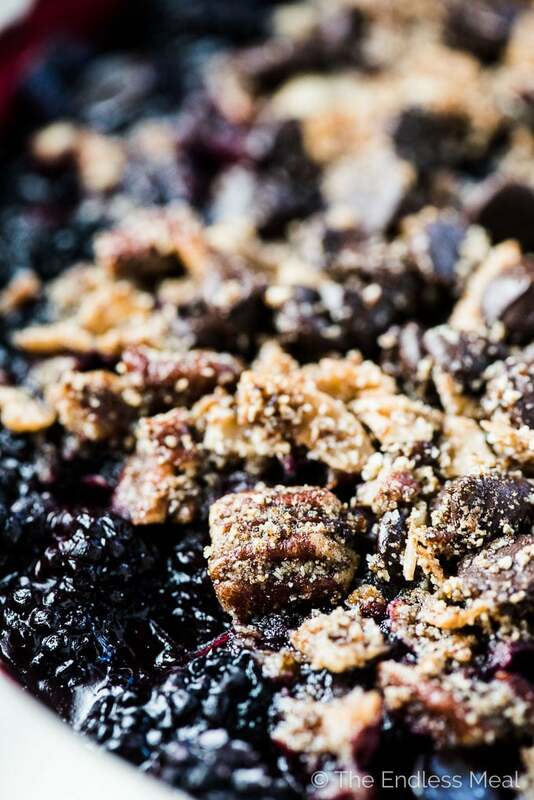 This Chocolate Blackberry Crumble is so good you'll NEVER know it's a healthy dessert recipe. The grain-free topping resembles your favorite traditional crumble topping but it's made without oats. It's crazy delicious. 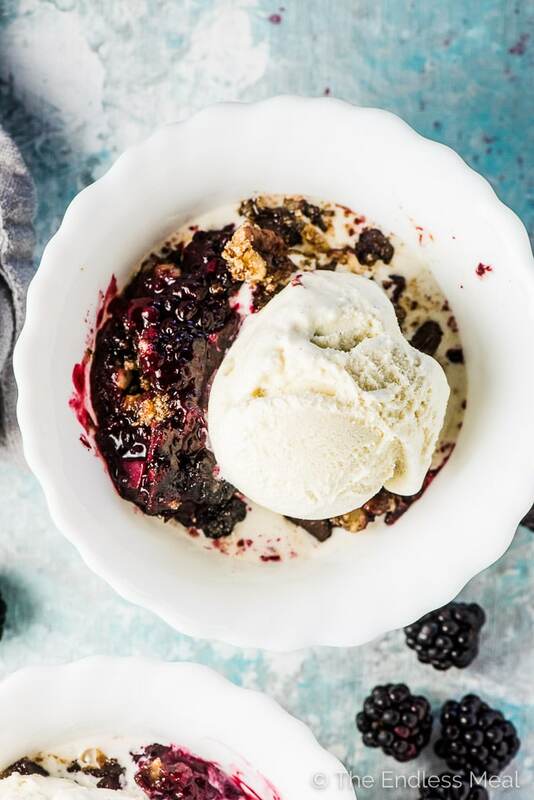 Chocolate Blackberry Crumble! 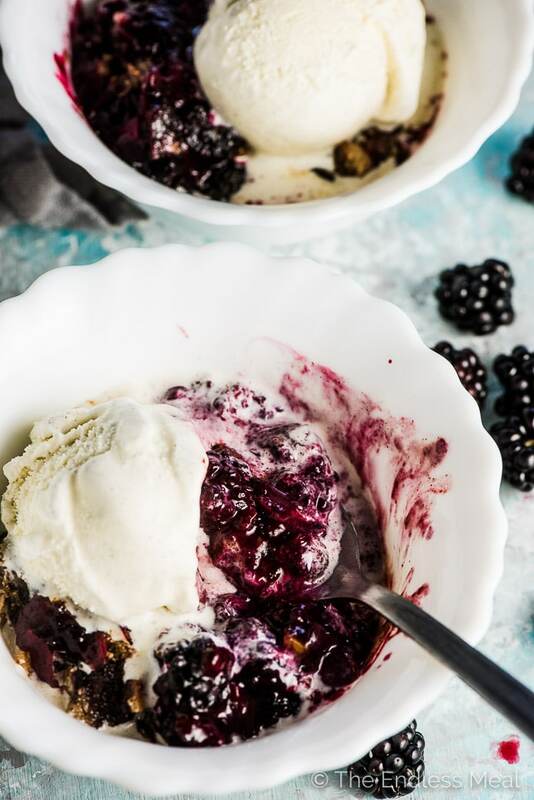 Sweet summer blackberries + dark chocolate + the best crumble that just so happens to be both grain-free and refined sugar-free. 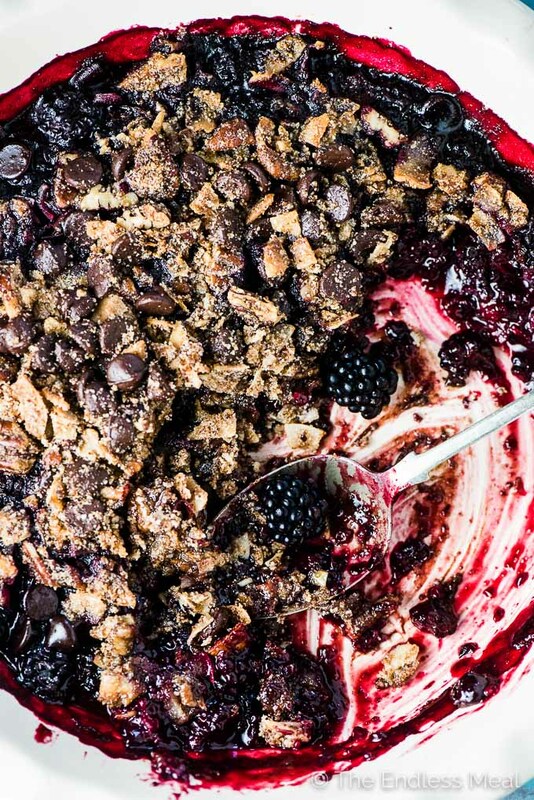 Seriously though, no one you share this Chocolate Blackberry Crumble with will ever ever ever know it's healthy. Healthy desserts that taste like regular desserts are THE BEST!! See those beauties up there? Those are wild blueberries that I picked after a run the other day. I have scratches all over my arms and legs to prove it. 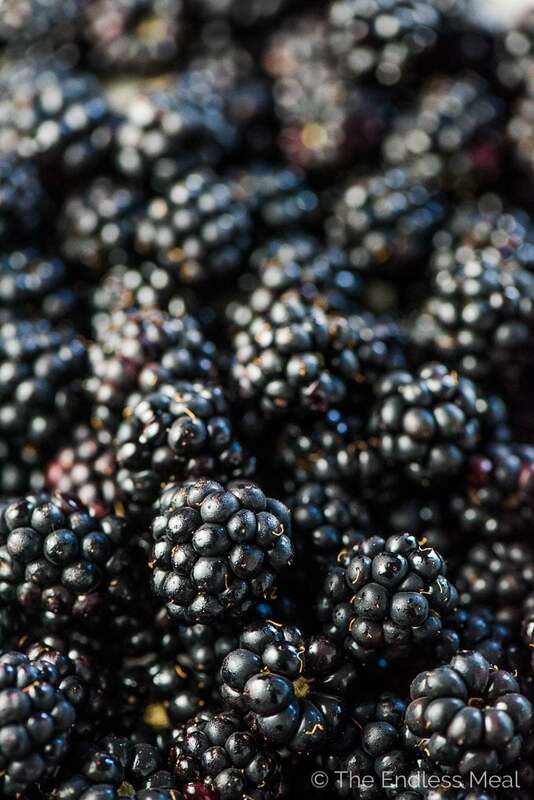 They are seriously the sweetest blackberries I have ever eaten. They should win an award for coaxing me out in this heat for four runs in a week. I'll shed a tear if even a single juicy berry goes to waste. Sweet and chocolaty love fest. The best ever crumble that's filled with chewy coconut and crunchy pecans. Super customizable. Got some peaches/apples/nectaries/any other berries on hand? Throw them in the bowl! If you accidentally eat the entire crumble to yourself you can pat yourself on the back for eating tons of fruit and healthy almonds and pecans. I know that crumble topping is supposed to have oats in it. But this one doesn't and I'm not making any apologies. Flaked coconut works best. It's a texture thing. Remember, we're trying to mimic oats. Coconut sugar. It's similar to brown sugar and adds a bit of crisp to the crisp. ← that was meant to be cheesy. Pecans. Chop them coarsely and they'll give just the right amount of crunch. Almond flour works great in place of regular flour in this recipe! 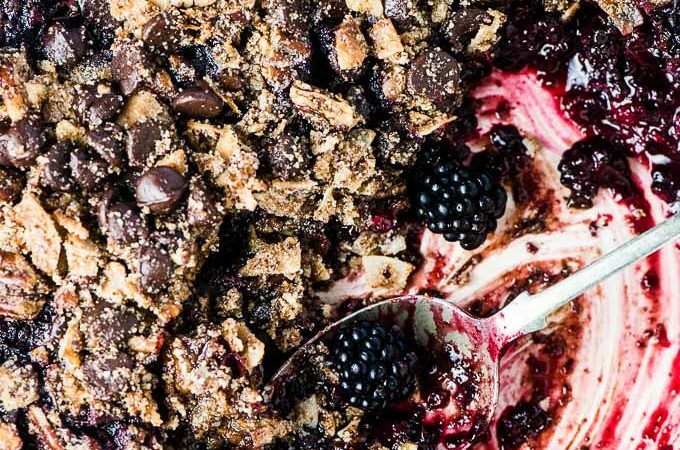 You could eat this blackberry crumble with delicious melted chocolate straight out of the oven and all on its own. But if you have some ice cream on hand, you'd be crazy not to scoop some on top. You could opt for your fav store-bought dairy-free ice cream or get fancy and make your own. This vanilla coconut ice cream or coconut cherry ice cream would both be amazing with this recipe! That bite right there is calling your name. Go ahead, you deserve it! Place the blackberries in a pie pan and sprinkle the tapioca starch and coconut sugar over top. Toss them gently to coat. 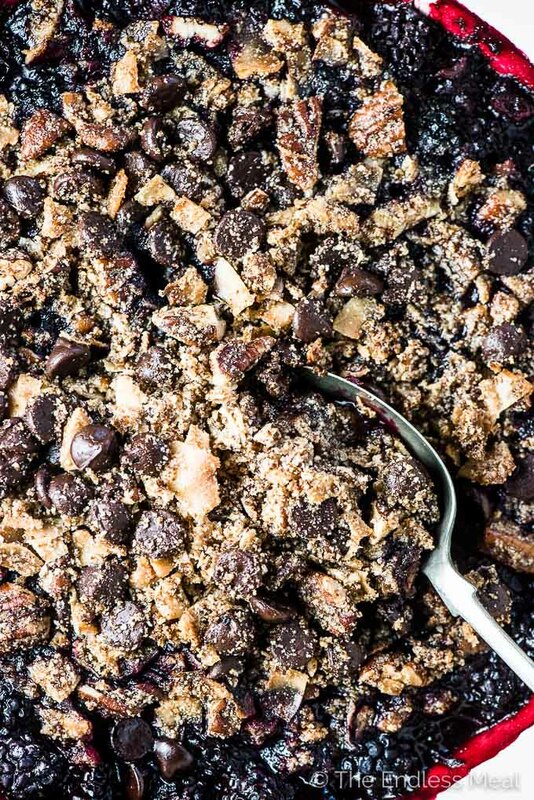 In a medium-sized bowl, mix all of the crumble topping ingredients. Sprinkle the topping evenly over the blackberries. Bake in your oven for 40 minutes, checking on the crumble after 30 minutes. If the crumble is starting to brown, cover the pie pan loosely in aluminum foil. Let the crumble cool for at least 15 minutes before serving. While you could substitute desiccated coconut, the texture of the crumble won't mimic oats as much as it does with flaked coconut. Brown sugar can be substituted for the coconut sugar. I picked a whole bunch of blackberries then went looking for a recipe to use some of them and found yours. The chocolate is such a great idea and we loved the topping even without oats in it. We were skeptical before we tried it! Will make it again when I pick some more berries. Isn’t blackberry season the best? So happy to hear you like the recipe! This looks absolutely delicious! Blackberries and chocolate–I don’t normally have them together, but I remember that these two foods are incredible when paired! They’re such a good combo aren’t they?! !